Identification: Moyle (2002); Becker (1983); Robison and Buchanan (1988); Page and Burr (1991); Jenkins and Burkhead (1994). Native Range: Atlantic and Gulf Slope drainages from Nova Scotia to southern Texas; Great Lakes, Hudson Bay (Red River), and Mississippi River basins west to Alberta, Montana, Wyoming, and western Oklahoma (Page and Burr 1991). Table 1. States with nonindigenous occurrences, the earliest and latest observations in each state, and the tally and names of HUCs with observations†. Names and dates are hyperlinked to their relevant specimen records. The list of references for all nonindigenous occurrences of Notemigonus crysoleucas are found here. Means of Introduction: The Golden Shiner is widely used as bait and as an ornamental and therefore has been transplanted into many areas, including parks in the United States (e.g., Lee et al. 1980 et seq. ; LoVullo and Stauffer 1993). According to Swift et al. (1993), the Golden Shiner arrived in San Diego County, California, in 1891 and quickly became widespread. Dill and Cordone (1997) stated this species was planted in parts of California as forage by the California Fish Commission during the late 1890s. It is the most commonly used bait fish in many regions, for instance California (Dill and Cordone 1997) and the Midwest (Burr, personal communication). Jenkins and Burkhead (1994) and Pflieger (1997) also noted that many populations probably became established through bait bucket introductions. 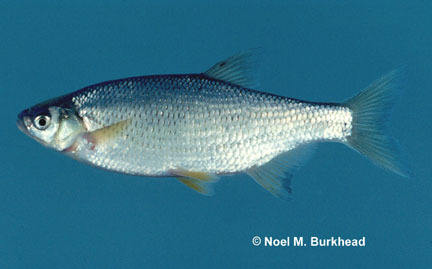 The Golden Shiner has been stocked in the Great Basin as a forage fish (Sigler and Sigler 1987). According to Jenkins and Burkhead (1994), it has been sparingly introduced to the New River drainage (earliest records: North Carolina 1949; Virginia 1971; West Virginia 1970). These researchers also noted that the earliest record of this species in the Virginia portion of the upper Tennessee drainage was 1966. That record was from a site near a hatchery that used this species as forage. Status: Established in all states listed above. Impact of Introduction: According to Moyle (2002), this species is widely introduced throughout California with unknown effects on native species. Eradication programs were reported as common in California (Sigler and Sigler 1996). A study by Shao (1997) showed that Golden Shiners that used brood nests made by Lepomis gibbosus resulted in reduced hatching success of L. gibbosus due to fungal infection from the presence of Golden Shiners. The reduced hatching success was offset by reduced predation on L. gibbosus eggs due to the presence of Golden Shiner eggs. Remarks: This species is similar in appearance to the rudd Scardinius erythrophthalmus, a European species that has been introduced into the United States. The two readily hybridize in laboratory conditions (Burkhead and Williams 1991). Dill and Cordone (1997) detailed the introduction history of this species in California. They speculated that some of the "minnows" used as food for fish being transported by the U.S. Fish Commission in the late 1800s may have been Golden Shiners. There is some debate concerning the native versus nonnative distribution of this species in the eastern United States. For example, Etnier and Starnes (1993) stated that this species was probably rare or absent from east and middle Tennessee before reservoir construction, but later became established in larger waters of these areas as a result of bait bucket introductions or expansion of "once-scattered populations." Jenkins and Burkhead (1994) noted that the species is probably more prevalent in Virginia than their distribution maps show because their data included few samples from farm ponds, habitats where the species has often been introduced. They also stated that most records from the Blue Ridge and Valley and Ridge in Virginia probably are of introductions. Sigler and Sigler (1996) stated that introduced Golden Shiners in Utah Lake, Utah, are barely maintaining population levels. In their analysis of fish zoogeography, Hocutt et al. (1986) listed this species as "introduced but possibly native" for an Appalachian drainage, the Kanawha River above the falls. Hocutt, C.H., R.E. Jenkins, and J.R. Stauffer, Jr. 1986. Zoogeography of the Fishes of the Central Appalachians and Central Atlantic Coastal Plain. In C.H. Hocutt and E.O. Wiley, eds. The Zoogeography of North American Freshwater Fishes. John Wiley and Sons, New York, NY, 161-212. Moyle, P.B. 2002. Inland Fishes of California. University of California Press, London, England, 164-166. Shao, B. 1997. Effects of golden shiner (Notemigonus crysoleucas) nest association on host pumpkinseeds (Lepomis gibbosus): evidence for a non-parasitic relationship. Behavioral Ecology and Sociobiology 41(6): 399-406.